One of the great things about being co-supervised by people at Landcare Research is that I get to engage to top notch scientists, ask them about their research, and sometimes help them in the field! From May 8th – 10th I was able to lend a hand to Barbara Anderson and her Master’s student Rob with their field work at Mt. Cardrona. 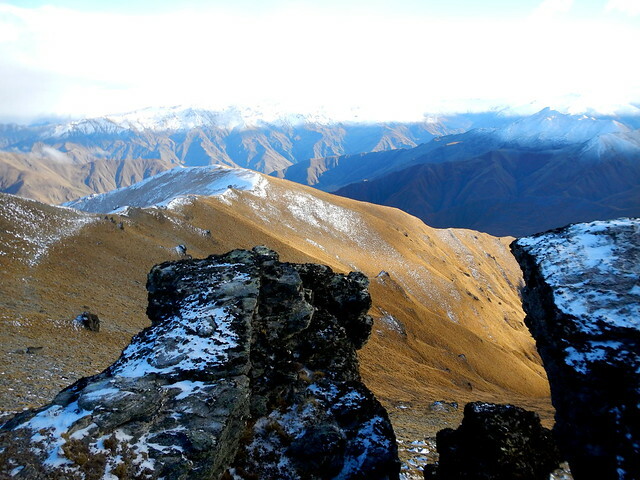 The view from Mt Cardrona Summit. Fiordlands are seen snowcapped in the distance. Rob’s research is on soil decomposition. When large organisms like trees and other plants die their organic matter become incorporated in to the soil. In areas with lots of vegetation the plant debris and litter that covers the ground is called the “O Horizon”. After awhile the plant material becomes partly decomposed and mixed with the next layer down, forming a nutrient rich environment called the “A layer”. It is here that most microbes reside and respire. Dead plant material gathering on the soil surface, forcing the litter layer. As particles decrease in size they are incorporated into the soil, forming the A horizon. Understanding the metabolic action of these microbes is important because they are vital to nutrient cycles. They decompose previously living tissue and extract bound carbon, nitrogen, and other nutrients to be released into the environment once again so that other organisms may reuse these resources to grow. 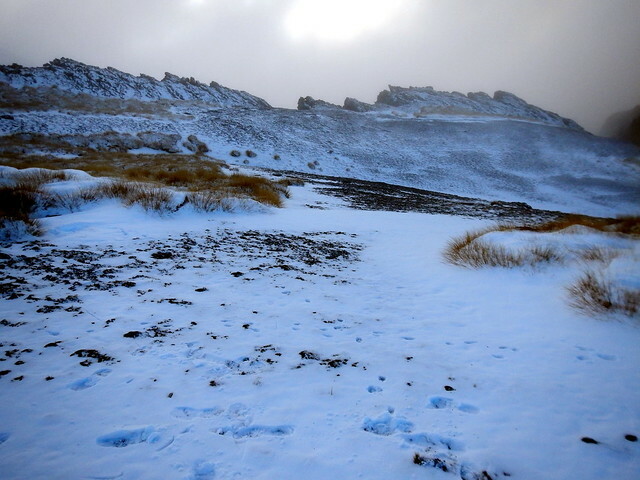 The snowy summit of Cardrona. Field work isn’t all fun and games! Global soils store 3-4 times the amount of carbon than what is stored in global plant biomass. Therefore, understanding what, and how, factors influence soil nutrient cycling is paramount, especially in light of climate change. Two factors that are likely to have a major influence over soil microbial activity are temperature and humidity. To elucidate the influence of these factors, Rob will be using the tea index across elevation and aspect gradients. The sites are positioned every 100m from the summit (~2000m) to the paddock (500m) spanning a ridge that has a sunny side and a shaded side. This range of elevation and ridge aspect encompasses a range of environmental conditions constrain microbial activity. 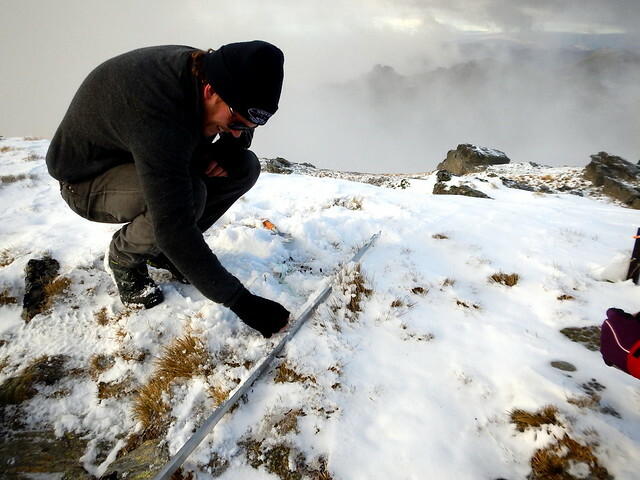 Rob exhuming the first tea bag from the summit. But how can we measure the metabolism of microscopic organisms on the top of a mountain? Cue the tea bag index. Microbes digest dead plant material. The rate at which they digest can be estimated by measuring the rate of weight loss in the dead plant material they eat. If we were able to develop a unit of recoverable plant mass that could sit in ground for long times and have standardized weights, we could use these units to estimate soil decomposition rates across locations. This is what the tea bag index does. Two flavors of tea are used – green and rooibos. Green tea is made of young leaves and roobios has mature leaves that are more lignified. The two break down at different rates, which allows Rob to estimate both the steep and shallow slope of the mass exponential decay function. 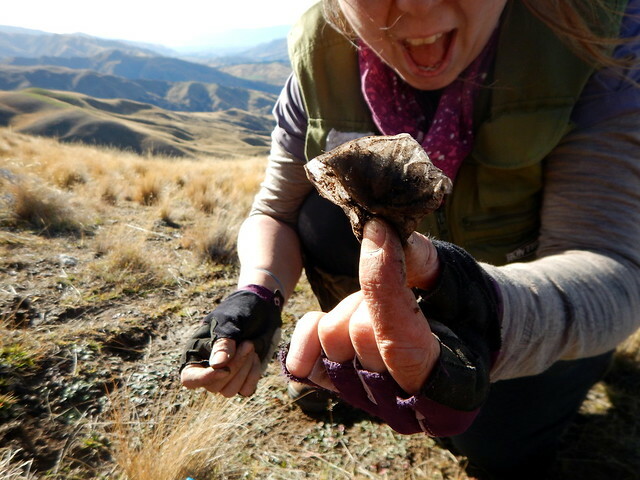 By burying mass produced tea bags in the ground at different locations we can gain information about the factors that influence decomposition rates by comparing weight losses. There’s nothing better than science with a strong cup of tea! I’ll be following up this post with results when they are in. Categories: Science rules! 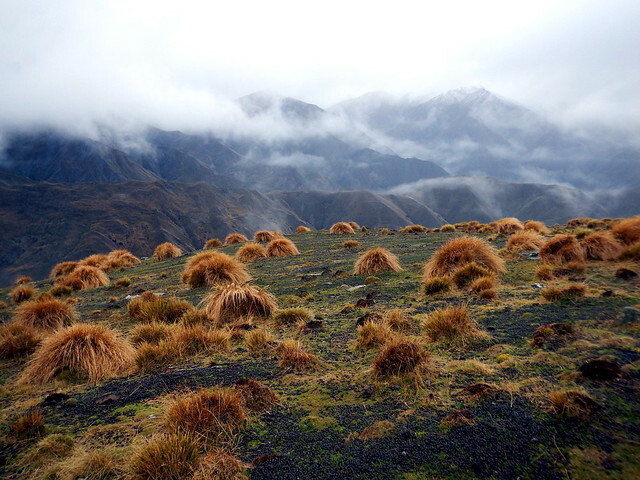 | Tags: Cardrona, climate change, conservation, ecology, Gregory Thomas Nelson, new zealand, research, Science, soil science | Permalink.